From the writer whose debut novel, The Hundred-Foot Journey, continues to charm readers around the world comes a modern fairy tale about a man who finds his true calling in a foreign land. Featuring rich descriptions and a cast of eccentric characters, this is a contemporary fable about a Japanese Buddhist priest who ends up finding himself in the unlikeliest of places. Growing up in a quaint mountainside village in Japan, Seido Oda spent his boyhood fishing in clear mountainside streams and helping his parents run their small inn. At the age of eleven, Oda is sent to study with the monks at a nearby Buddhist temple. This peaceful, quiet refuge in the remote mountains of Japan becomes home for the introverted monk-until he approaches his fortieth birthday and is ordered by his superior to cross the ocean and open a temple in Brooklyn. 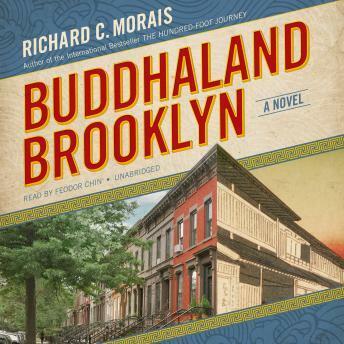 Ripped from the isolated, serene life of his homeland temple, Oda receives a shock to his system in New York-a motley crew of American Buddhists whose misguided practices lead to a host of hilarious cultural misunderstandings. It is only when Oda comes to appreciate the Americans, flaws and all, that he sees his own shortcomings and finally finds that sense of belonging he has always sought. A lively and vivid novel, this entertaining and edifying meditation on the meaning of true acceptance stirs from the very first page.